If you're looking for a luxurious getaway that can accommodate your large group, you found the place! Enjoy luxury living at the North Shore Luxury Plantation and Ranch Oasis Combo. The combo is composed of the North Shore Luxury Plantation, 5-bedroom, 4.5-bath and the Hawaiiana Ranch Oasis, 4-bedroom 4-bath. All in all, the property can sleep up to 22 guests. The newly built North Shore Luxury Plantation is a custom home with ocean, mountain and horse ranch views is a brand new 4 bedroom/4 bath villa plus attached studio that sits on 3 acres across from a pristine North Shore beach park, just south of Turtle Bay Resort. Our luxurious and family-friendly villa is perfect for large groups who appreciate 4 bedrooms all with king size beds, 2 sofa queen sleepers in the living room and studio permit a great nights sleep for all. Upstairs is a large recreation room with a foosball table, air hockey table, workout equipment and a spectacular ocean view from an open air lanai. Downstairs is a huge covered lanai for hanging out and dining at a custom built monkeypod slab table. Air conditioning throughout the house ensures comfort when the tradewinds stop their cooling influence, 4.5 bathrooms ensure no morning lines. There's Wi-Fi and fax on-site. The property is very close to shopping, grocery and drug stores. Minutes from historic Haleiwa town, Turtle Bay Resort and Golf and the Polynesian Cultural Center. Sunset, Waimea, Ehukai, Laniakea, Haleiwa, 3 Tables, Sharks Cove and Pipeline are among the many world famous surf breaks, beaches and snorkeling & scuba diving locations near the Villa. Every booking for 10 days or longer includes a Private, Day Sail & Snorkelling Charter with Capt Ken aboard a 43' sailing yacht with just your family aboard. Villa also comes with kayaks, stand paddle board, boogie boards, snorkelling equipment, beach chairs, umbrellas and beach toys. Enjoy the ambiance of your home in Kawela House and the people in the neighborhood. Located in the North Shore of Oahu where famous places and activities are present. Try everything new and make memories! This expansive, BRAND NEW, two story 4 bedroom Hawaii ranch style home sits perched on two and a half acres of land and is in a safe, gated neighborhood. It is the perfect family home, with something for everyone. Kids can enjoy the fun surf-themed bunk bed room and TV area, while parents savor the huge, upstairs master suite and relax in the master bathroom soaking tub. The open concept kitchen area, with Bosch appliances, stunning views, and ample island seating provides the perfect gathering place for friends and family. Expansive wrap around decks and views from every window are what make this home extraordinary. Whether it is grazing horses, crashing blue waves, or lush mountainside...these views do not disappoint. In less than 5 minutes, you can WALK to the beach. Snorkel, sunbathe, collect shells, grab some fresh pineapple from the fruit stand below the property... and then walk home to jump in the hot tub and relax as you enjoy the magical and tranquil views. World famous surf, dining, golf and hiking are just minutes away. Since this home is newly built, and fruit trees and landscaping are still growing in, we are offering a discounted rate through July 2015. 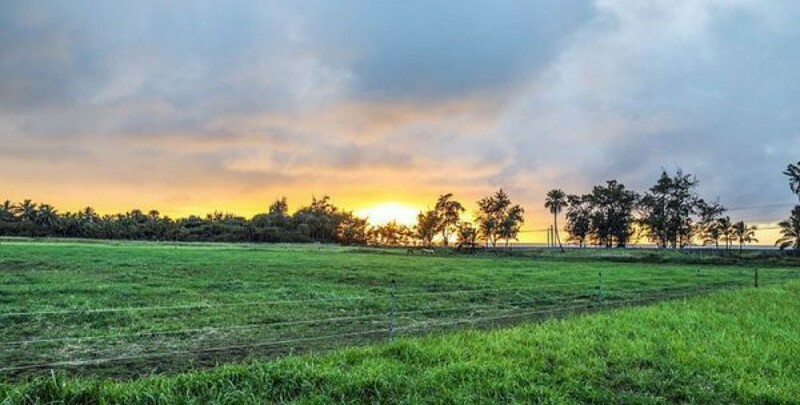 Don't miss this opportunity to experience 'Kawela Ranch Paradise,' A true north shore treasure!